Crystal Palace have confirmed the signing of Michy Batshuayi from Chelsea on a short-term loan for the campaign. The Belgium international had spent the first half of the season on loan with Valencia but an unimpressive stint meant that Los Che terminated his temporary deal. Thereafter, the Blues had planned to part ways with the striker on a permanent transfer but the lack of suitors eventually paved the way for the Eagles to sign him on a short-term loan. Still, the South London outfit have not been able to finalise a buy option for the Belgian and he is due to report to Chelsea when the season comes to a close. 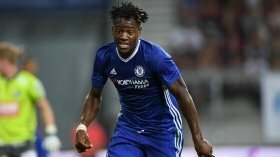 Batshuayi has recently been in Valencia vacating his belongings but he is expected to report in time for the Eagles' weekend Premier League clash against Fulham. Crystal Palace go into the game after a 1-1 Premier League draw against Southampton and this sees them four points ahead of the relegation positions.